A cracking Christmas hamper filled with tasty seasonal products at a very reasonable price. Each one has been carefully selected so you can be sure everybody will find a favourite. Choose between luxury mince pies, rich fruit cake, crisps and nuts. 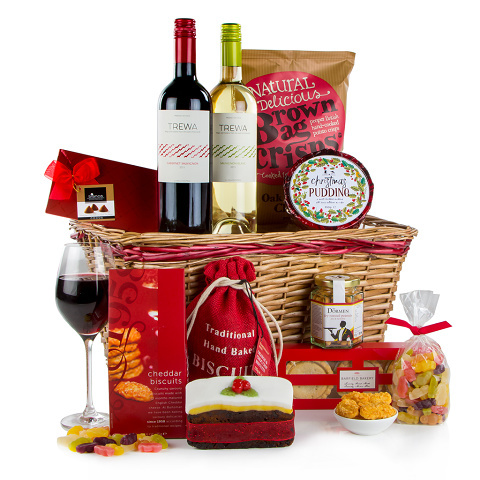 This cracking hamper is made complete with a pair of Trewa wines - one Cabernet Sauvignon and a Sauvignon Blanc. Simply the perfect hamper choice for any family get-together, party with friends or as a gift for a colleague or client. The Christmas Cracker Basket Hamper is also available in a really convenient 100% recyclable festive carton.